Bacteria are microorganisms that grow everywhere. We can collect and grow them in specially prepared petri dishes. Blood agar or tryptic soy agar with 5% sheep's blood is an excellent medium for supplying bacteria with nutrients and an environment in which we can see them grow. Sterile powdered agar with nutrients can be mixed with water, heated and then poured into empty petri plates or ready-to-use dishes can be purchased. The undigestible agar is a gelatin-like substance with a semi solid surface on which the bacteria can grow while they consume the added nutrients (like sheep's blood). In fact, this is why gelatin itself does not make a good growing medium. Some bacteria can digest gelatin, which is a protein derived from animal tissue. This destroys the growing surface in the petri plate making it unsuitable as a bacteria growth medium. CAUTION. Most bacteria collected in the environment will not be harmful. However, once they multiply into millions of colonies in a petri dish they become more of a hazard. Be sure to protect open cuts with rubber gloves and never ingest or breathe in growing bacteria. Keep growing petri dishes taped closed until your experiment is done. Then you should safely destroy the fuzzy bacteria colonies using bleach. Below are general outlines of three types of experiments involving bacteria growth. They are offered to assist in designing your own experiment or project. In this type of experiment, bacteria is transferred directly to the prepared petri plate via direct contact. You can test the effectiveness of different soaps by treating different petri dishes with "dirty" hands before washing and "clean" hands after washing. Or, you can press a variety of common objects like coins, combs, etc. on different plates and compare the bacteria growth that results. Prepared petri plates containing agar medium and nutrients. The Science Company has these available at this link. Bacteria on hands, paws, etc. Wax pencil for labeling dishes. Prepared petri dishes should be refrigerated until used and always stored upside down (i.e media in upper dish, cover on bottom). This keeps condensation which forms in the lid from dropping onto and disrupting the bacteria growing surface. When ready to use, let dishes come to room temperature before taking samples (about one hour). Replace cover on dish, tape closed, and label each dish so you know the source of the bacteria. Store upside down. Let grow in undisturbed warm location. Bacteria can grow at any temperature from about ambient room temperature (hopefully around 70°F) all the way up to about 100°F. Do not place in sunlight or on a heating register. You should see growth within a couple of days. The dishes will start to smell which means the bacteria are growing. Make observations and keep records of what you see growing in each dish. Can you make any conclusions about what objects had the most bacteria? Before disposing of dishes in the trash the bacteria should be destroyed. Pour a small amount of household bleach over the colonies while holding dish over sink. Caution - do not allow bleach to touch your skin, eyes or clothes. It will burn! Use a sterilized inoculating loop or sterile swabs to collect bacteria from different locations and then streak each petri dish with your sample. This involves a bit more technique than Experiment 1 but offers a wider choice of bacteria sampling locations. Swabs can be run over doorknobs, bathroom fixtures, animal mouths, etc. Prepared petri dishes containing agar medium and nutrients. Bacteria collected from doorknobs, bathroom fixtures, etc. Sterile swabs or inoculating loop. Alcohol burner (source of flame to sterilize inoculating loop). Collect bacteria from each location using one swab (or resterilized innoculating loop) for each new spot. Inoculate each dish by streaking a pattern gently across the entire agar surface without tearing into it. Another common technique is to divide each plate into four quadrants by marking the lid with a cross. Streak your sample in straight lines starting in quadrant 1. Generally, after a few days, quadrant one will show the most growth. Depending on bacteria abundance on the swab, quadrant 4 may show no grow or only a few colonies. It is sometimes easier to distinguish different bacteria types in this low growth, less cluttered area. Make observations and keep records of what you see growing in each dish. Can you make any conclusions about what locations had the most bacteria? In this type of project, a petri dish is inoculated with bacteria then a paper disk (filter paper) treated with an antiseptic agent is placed in the dish. After several days, a halo develops around the paper disk indicating a zone of no growth. Comparisons can be made between different antibacterial agents. Antibacterial agent (soaps, disinfectants, etc.). Test tubes, 12 x 75mm. Filter paper or paper towel. Small containers in which to soak paper disks. Prepare sterilized water by boiling water and letting cool to room temperature. When ready to use, let petri dishes come to room temperature before taking samples (about one hour). Prepare antiseptic disks by using a hole punch to create paper disks out of a piece of filter paper or paper towel. Soak one disk in each antibacterial agent to be tested. Set aside until step 6. Collect bacteria from each location using one swab for each new spot. Fill a small test tube partly full of sterilized water. Dip bacteria laden swab into water. This will transfer some of the bacteria you collected into the water. Now, inoculate a petri dish by pouring the water into the dish so the entire surface is covered. Pour out excess water. Repeat for each bacteria sample using fresh water and clean test tube each time. 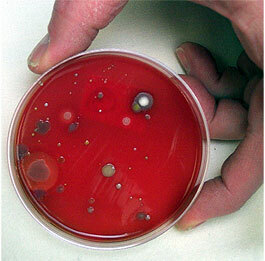 Place a pretreated antiseptic disk in each inoculated petri dish. Replace cover on dish, tape closed, store upside down. Be sure to label each petri dish with a name or number. You should see growth within a couple of days. You should also see a "halo" around each disk indicating a no growth zone. Measure and compare the size of the kill zone to determine effectiveness of each antibacterial agent. There are many variations of the basic steps outlined above. Let us know what you tested and how your experiment turned out. We'd be delighted to hear from you! Click here and use our Contact Us form. 12 x 75mm Test Tube.